Bayfront Bistro is simply amazing. The food is fantastic and the atmosphere is great. This entire facility is new and it shows. I cannot even begin to tell you the best dish on the menu, because everything is so great there. From the appetizers toany of the meals, lunch or dinner. You will not be disappointed. For us boaters, there is a full service marina and much more. This facility offers so much, I think it would be better just to go to their website and check it out for your self. You are going to love this place. Below are just a few photos for you to enjoy. The are two ways to access Bayfront Bistro. Coming from the water, come around the north end of Ft. Myers Beach (Matanzas Pass) and follow the well marked channel south. Or you can come from the south end of Ft. Myers Beach through Big Carlos Pass and head north, north west. The channel is well marked. 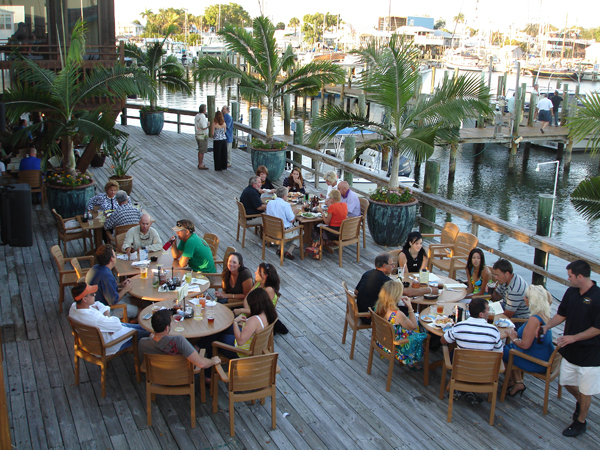 When you get to Bayfront Bistro and Snook Bight Yacht Club & Marina, you cannot miss it. Make it a great time!!! Have I got a place to go for you this weekend in the boat. 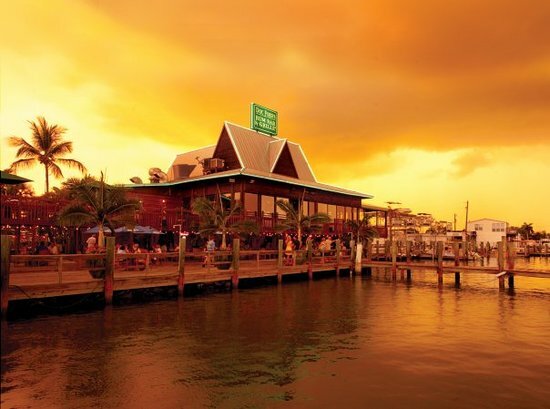 Have you heard of the Gulfshore Grill & The Cottage on Ft. Myers Beach? This is a great time of year to go (Spring Break). If you like to people watch and have a great time you have got to go. 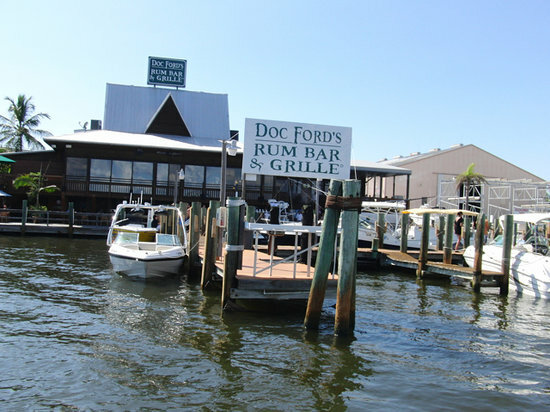 Once you have anchored off of Ft. Myers Beach, you can walk up to the beach and get lunch at the Cottage. At The Cottage you can sit out on a deck or inside over looking the beach and Gulf of Mexico and watch all the people, it is really quite amusing. The food at The Cottage is really good an the cold beverages are great too. If you want to dine inside in the air conditioning walk next door to the Gulfshore Grill which also offers amazing views of the beach and Gulf of Mexico. The food here is really good as well. After lunch you can go down stairs to the Beach Bar and hang out enjoy a cold beverage and people watch. Or throw a Frisbee or play smash ball or just relax in the refreshing waters of the Gulf of Mexico. You will have a great time here, everyone is happy and having a great time!! !Oh, do not forget you camera. Enjoy the photos. How do you get there? This is easy. Starting from the Sanibel Causeway. Head towards Fort Myers Beach VIA the intra coastal waterway. Keep heading down parallel to Ft. Myers Beach. You will see the big Concrete pier, just past the pier, you will see a large green building. Right to the left of the Lani Kai (the green building) you will see The Gulfshore Grill and The Cottage. You cannot miss it. This is easy. 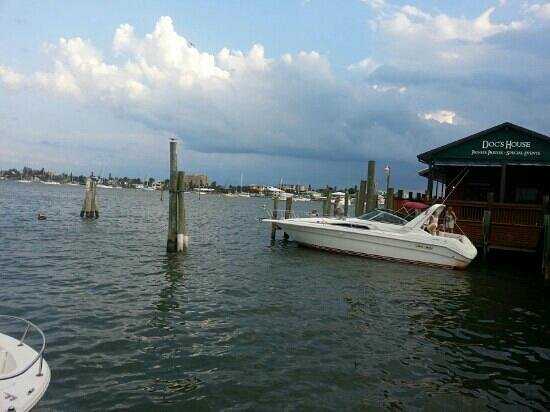 Coming from Cape Coral Yacht Club, get into the ICW and head towards the mouth of the river. Go through the slow zone, when it says to resume normal speed, go almost straight ahead, you will see a green marker this is the opening of the miserable mile as some people call it. Proceed stahying in the channel, do not go out side the channel or you will run aground, it is very, very shallow outside the channel. Follow the ICW into Pine Island Sound. You will have the back side of Sanibel on your left. Keep following the ICW. When you get to Green Marker 35 make a left towards land approx. one mile you will see a Red head pin marker, should be number “2″ marking the channel going into the channel into the harbor area. (Stay in the channel there are some shallow spots just outside the channel) Follow the markers in. The Green Flash restaurant will be on your right. You will recognize it from the photo attached. Have a great time!! Cape Coral Events: Cape Harbor Hosts 5th Annual “Water and Wheels”! Get ready for a weekend filled with fabulous yachts, boats and cool cars along with live music, food and fun as Cape Harbour presents its 5th annual “Water and Wheels”event on March 4th, 5th and 6th. Admission to the family fun event is free and open to the public. Cape Harbour’s four-star restaurants are gearing up for the event. Rumrunners, The Joint and Run Agrounds will offer food and drink specials throughout the weekend. Hello everyone, I hope you all are doing great. It has been quite chilly down here. Well actually down right cold some nights it got to the mid 30’s. That is freezing for us. The water temperature has dropped a bunch too and the bait has all but disappeared. I am not sure where it goes, probably deeper water where it is warmer believe it or not. I think this time of year the best thing to do is put in and go The Bait Barge in the mouth of the Caloosahatchee River. Call Rick or Debbie 239-677-7179 . They will be there Saturday and Sunday with Live shrimp and Pin Fish. Call ahead, Rick and Debbie will reserve your bait for you. This is awesome!!! I spoke to Capt. Billy Hammond. He said the bite is still on and the bait of choice right now is live Shrimp. Capt. Billy said they are catching lots of Red Fish, Sheeps Head and bunch of Flounder. The Trout are beginning to bite as well. I am telling you if you want catch fish and have a great day on the water, contact Capt. Billy..http://endlesssummercharters.net/ . Here is a thought, Capt. Billy took out the guys fishing yesterday and caught all kinds of fish. Now today Capt. Billy is taking out the families of these guys sight seeing, Shelling and stopping for lunch at the world Famous Cabbage Key http://cabbagekey.com/home/ Ya know it has been said that Jimmy Buffet wrote Cheese Burger in Paradise there sitting at the bar at Cabbage. Yes the food is great and the atmosphere it great.. Okay getting back to Rick and the bait barge, he was out earlier this week and look what he caught.. Huge Black Drum. Yes, he released it unharmed to breed and make more babies. 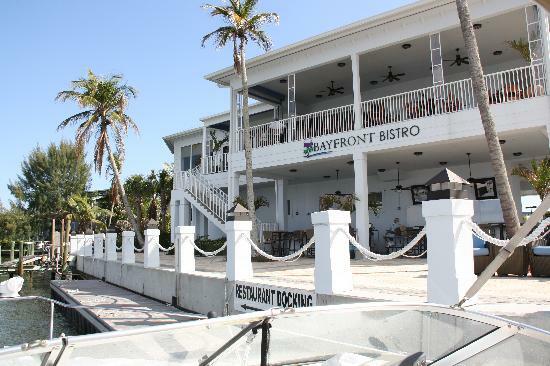 Have you been to Matanzas Inn Bayfront Resort: Motel, Restaurant, Marina? Hello everyone. I hope you all are doing great. I know is has been a couple weeks since I have done the boating guide. We have just been very, very busy, work, then the weather was nasty for nearly 5 days in a row, lots of rain, etc. I did want to update you on the oil spill. As I am sure you have heard the oil well has been capped off. The Beaches here in Lee County, covering Bonita Beach, Ft. Myers Beach, Sanibel, Captiva Islands, Cayo Costa, Boca Grande, Little Gasparilla are all oil free. No oil in the water or on the beches, NO oil….This is great news for us. Once again based on the computer models, there appears to be less than a 1% chance that we are going to see any oil. Please keep the other folks in the affected areas in your thoughts and prayers. The areas hit the hardest with the oil are having a really tough time. Once again, please keep them all in your thoughts and prayers. I do not think I know any more than you do about where the oil is going. If I hear anything new, I will be sure to let everyone know. Happy Fourth Of July Weekend!!!!!!!! Hello Everyone, I hope you are doing great.